Does anyone know the current highest dps specs (ele, boomkin etc)? or where to find them? These are the current simcraft DPS ranks. Take them with a grain of salt though, some specs are less optimized than others. Also, it applies to level 90 characters with Tier 14 Heroic. Things may be well different at level 85 in Tier 13. IMO, you asked that question in wrong time. I think so cause game is totally unbalanced since its in "between" expansions mode and, as history says, this is quite normal for Blizzard. Classes are now balanced around lvl 90 and new gear that we dont have it yet. Some classes are better than other on lvl 85 cause it will be, when MoP hits live, just another level that you passed on your way to lvl 90 and your greatness. So, the question that you asked now will only apply on 3weeks period, till MoP goes live. Also, be aware that beta is still up and they are still doing changes to classes/specs.. As Stasis said and posted, Simcraft is pretty much correct, but again, you must count in "human factor" cause Sim takes best possible actions for increasing/doing damage, you might not be able to press DPS increase button as simcraft counted when you are under heavy damage period, you might need to press Defensive CD, gimping your DPS a bit, but making you live longer. Its a must, specially now when healers have fixed mana pools and need to watch on mana efficiency more. In current beta in endgame gear classes are pretty much good balanced and similar in DPS. Some of them might doing lower damage trough fight, but go ballistic when you enter "execute phase." Currently, on 5.0.4, for instance a exceptional Ele shaman and Combat rogue are complaining that they are free kill in PvP, while shockadins (yup, they are back) are doing insane damage and healing cause there is no Holy spell resistance. The game is no more cookie cutter orientated (which means that you cant just took best DPS/Healing talents for your build and just forget them) game is now more situational, you will/might/want to choose different talents for different encounters. 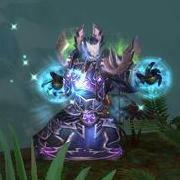 What is now relevant that you set up your characters as you want to and enjoy playing the game, learning your new builds/specs/classes and prepare for MoP. Edit: You also didnt tell are you interested in PvP or PvE, that is also counting is cause all of the changes that PvP is getting. For instance, as holy pala (shockey build) im doing well in PvP as Healer AND DPS, im not hitting highest damage done, but we are pretty hard to kill. I PvE, i tried DPSing as Shockey, and i hitted lower part of chart.